You deserve to be loved and accepted for who you are. If no one has told you, then I am glad you found my blog because I get to tell you. None of us are perfect. So, get that out of your head now, the perfect version of yourself already exists and it is you right now. Sure, there is always room for improvement but growth should come from a place of gladness to be you. Don’t feed into societal pressures, media at large doesn’t provide a diverse perspective on beauty. Celebrity worship wont help you either because we aren’t suppose to live up to an image or idea of perfection, rather we should aspire to live up to being the best versions of ourselves. If you are having a tough time finding the love you so rightly deserve, you absolutely MUST love yourself first! In the very beginning, it will feel weird or “off” because we aren’t used to loving ourselves unconditionally. That’s ok, like anything worth having, self-love takes practice, patience and plenty of discipline. Do a personal inventory and clean shop. Surround yourself with people who love you more than you love yourself. Find people who will be nothing but supportive, encouraging, accepting, and honest. Keep them close to you, hold them tight. They will lift you up when you are down. Anyone who cannot do that for you should be ejected from your life immediately. How can you tell if someone isn’t good for you? Take stock of the way you feel when you think about someone in your life. Are you uneasy, doubtful, stressed, unsure, insecure or any version of those feelings? If so, they need to go. Hush the critical voices in your head. My inner voice is constantly nagging and criticizing me. It takes so much effort to still the voices that creep in to sabotage me. It turns out that women in general suffer from an acute lack of confidence. Studies show that men tend to overestimate their abilities and performance, while women underestimate both. Even when their performances do not differ in quality. So, we must make constant and steady efforts to quiet our minds and the voices that tell us we can’t. Everyone has their own way of doing this, I write through my pain and self-doubt, while others meditate or practice self-affirmations. How you quiet your critical voices is up to you but figure out how to manage it and practice daily. Forgive yourself. We make mistakes, some times repeatedly before we learn from them. To be human is to be flawed and part of loving yourself better is loving the flaws too. This means forgiving your past, forgiving those who wronged you and most importantly, forgiving yourself. How do you do this in practice? Be conscious about your thoughts, be present and speak to yourself the way you would speak to someone you love, with kindness and compassion. Care for yourself. Self-care is active participation in enhancing the quality of your health. Adults work too much, if you are a parent you prioritize your kids, if you are a caregiver with an ill or elderly loved one, caring for them takes precedence. Usually we put ourselves last on the list if we even make the list at all. Living this way can burn us out. 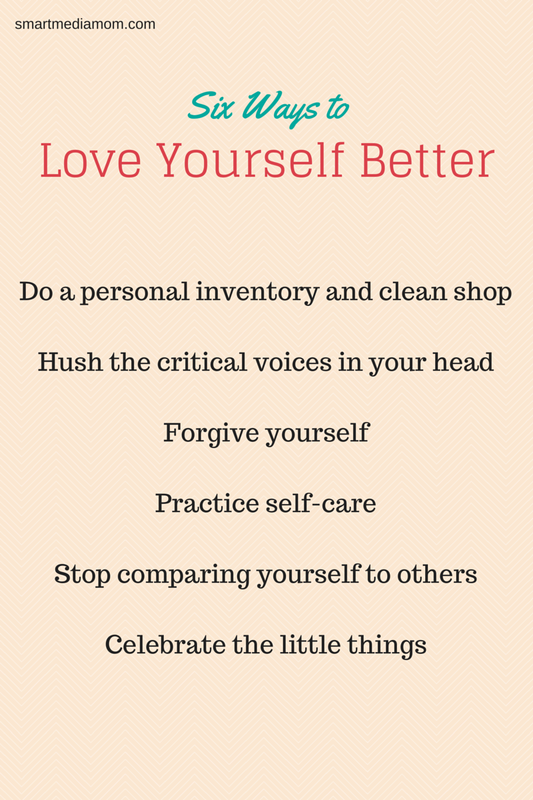 Loving yourself better means caring for yourself daily. So make time to unplug from the world and plug into yourself. Charge your batteries through activities of self-care – yoga, a day at the spa, a bubble bath, or any healthy activity that leaves you feeling good inside and out. Stop comparing yourself to others. You are uniquely you and no one else on the planet can be that. Embrace yourself wholeheartedly, the great things about yourself and the not so great things too. If you walk into a room and begin sizing people up and making comparisons, STOP! See tip #2 and hush those voices immediately. Rather than pointing out all the ways you are different form everyone else, find the similarities. You’ll be surprised at how much you have in common with everyone around you. Celebrate the little things. Every day I wake up and drag myself out of bed is a victory. It should be so for you too, life is a gift and it is meant to be celebrated. It’s easy to be proud of our big accomplishments, graduating, childbirth, a new job or promotion and they deserve to be celebrated too. But loving yourself better is about feeling good for the little things as well as the big things. The little things happen much more often. Dance to your favorite song or pat yourself on the back for getting dinner on the table. Most important, cheer yourself on daily for managing to keep it together when everything seems to be falling apart. Above all else, remember this, when you are surrounded by darkness and you cannot see the light, it is because the light must come from within. You must be willing to shine, perhaps your light will illuminate the darkness for someone else.